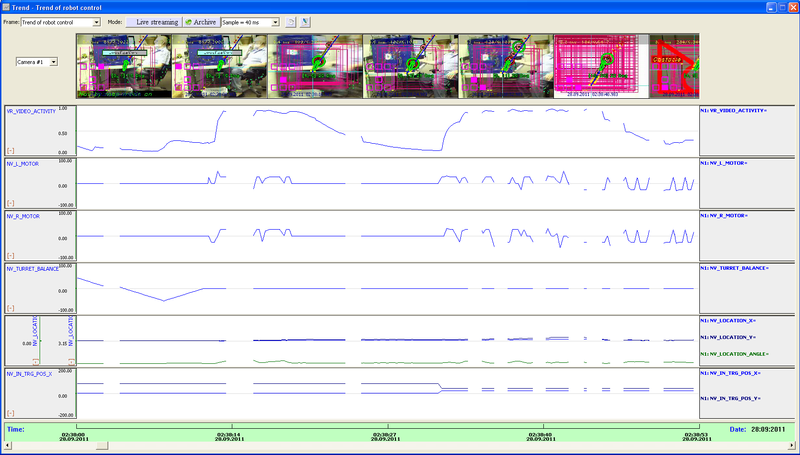 Since October 2007 I developed new object recognition algorithm "Associative Video Memory" (AVM). 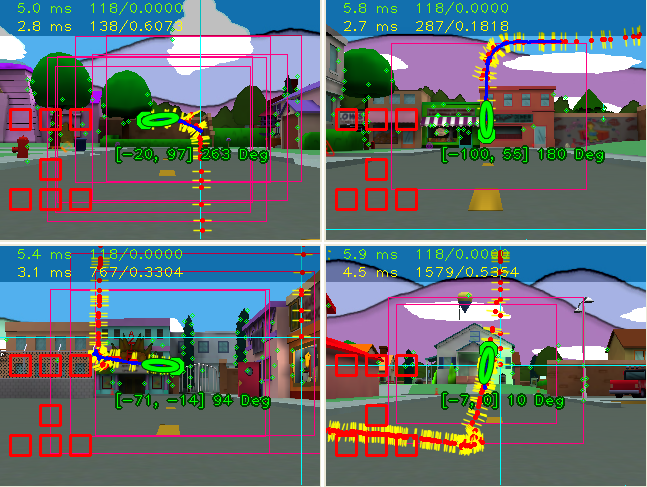 Algorithm AVM uses a principle of multilevel decomposition of recognition matrices, it is steady against noise of the camera and well scaled, simply and quickly for training. And now I want to introduce my experiment with robot navigation based on visual landmark beacons: "Follow me" and "Walking by gates". I embodied both algorithms to Navigator plugin for using within RoboRealm software. 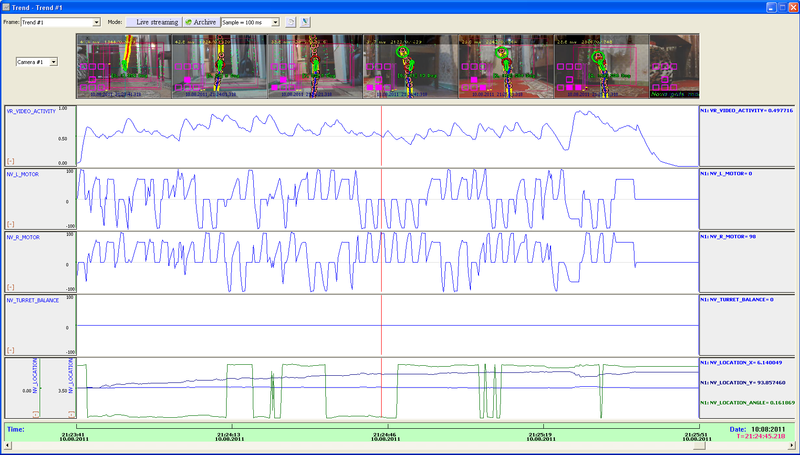 So, you can try now to review my experiments with using AVM Navigator. The gate data contains weights for the seven routes that indicate importance of this gateway for each route. At the bottom of the screen was added indicator "horizon" which shows direction for adjust the robot's motion for further movement on the route. Field of gates is painted blue if the gates do not participate in this route (weight rate 0), and warmer colors (ending in yellow) show a gradation of "importance" of the gate in the current route. in "Nova gate" mode and then you must drive the robot manually by route (the gates will be installed automatically). In the end of the route you must click on the button "Set checkpoint" and then robot will turn several times on one spot and mark his current location as a checkpoint. So, if robot will walk by gates and suddenly will have seen some object that can be recognized then robot will navigate by the "follow me" algorithm. for searching (it may twitch from time to time in a random way). For more information see also thread: "Autonomous robot's navigation" at Trossen Robotics. i love robots and this thread gets my interest. Now AVM Navigator v0.7 is released and you can download it from RoboRealm website. In new version is added two modes: "Marker mode" and "Navigate by map". 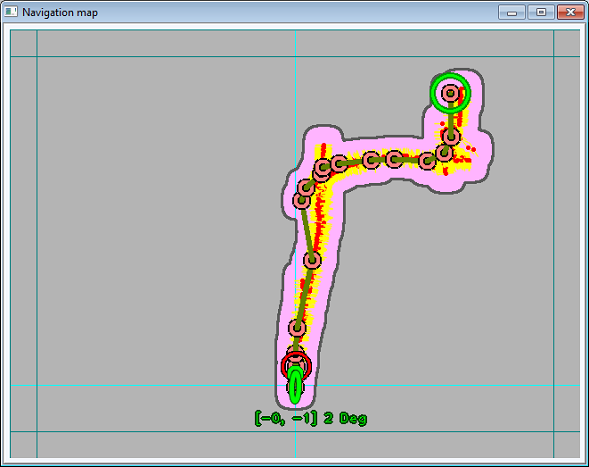 Marker mode provides a forming of navigation map that will be made automatically by space marking. You just should manually lead the robot along some path and repeat it several times for good map detailing. In this mode you should point the target position at the navigation map and further the robot plans the path (maze solving) from current location to the target position (big green circle) and then robot begins automatically walking to the target position. NV_IN_SUBMIT_POS - submitting of target position (value should be set 0 -> 1 for action). 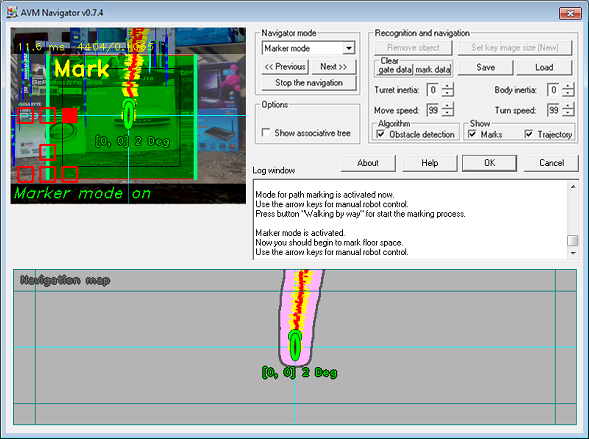 with the AVM module to control the movement and processing of images from the Quake first person video game. This allows you to work with visual odometry techniques without needing a robot! The additional software needed for this integration can be downloaded here. Is it possible to play with virtual robot in "Navigation by map" mode? Just look into documentation and download the "AVM Quake 3 mod" installation. I finally got my hands on a Roomba robot that I could try with the Nav programs. I went through all of the items and tutorials. When I placed the robot in the NAV mode, it moved. All others did not move unless I used the arrows to train them. The Nav by map mode showed the progress, but I could not get it to move by clicking on Left mouse. When I clicked on Left mouse it did not do anything. I would like to make that work. Can it work on it's own, or do I have to train it in one of the other modes? See more details about tuning of "Marker mode" and "Navigation by map" modes. AVM Navigator help page was updated!